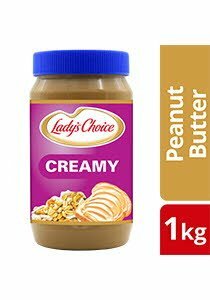 Creamy peanut butter. Ideal for kare-kare, sandwiches & dips. Peanuts, Sugar, Emulsifier (Monoglyceride), Iodized Salt, Vitamin B1, Vitamin Acetate, Vitamin A Palmitate, Vitamin D3. Keep in a cool dry place and avoid direct sunlight.